Lately, with the temps getting cooler, I find myself thinking of stews, pasta and other hearty, stick-to-your-ribs type dishes. So when I started looking around for recipes I could make fitting that criteria, I thought of one pot, rice-based entrees. 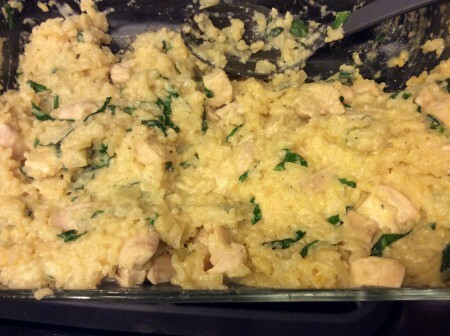 When I came across a risotto recipe not requiring epic amounts of stirring, I was overjoyed and needed to try it ASAP. What’s the secret that takes the stirring out, you ask? Baking it in the oven with lots of chicken broth and white wine. Eureka! Let me tell you, I’ve only tried it once so far, but I already know I’ll be making this one again. I don’t know exactly how or why baking this particular dish in the oven works the same as stirring a pot of arborio rice for eons, but it does and I (and my taste buds) couldn’t be happier. As long as you have a little time on your hands (it takes roughly an hour to cook in the oven), give this recipe for baked chicken risotto with pancetta frizzles a spin. And if you’re like me and take leftovers for lunch to work the next day, you’ll really be a fan of this recipe. The chicken risotto reheats like a dream. Great stuff. Preheat oven to 375 degrees Fahrenheit, and coat a 9×13 inch baking dish with cooking spray. Combine rice, shallot and garlic in the baking dish. In a bowl, combine broth, wine, salt and pepper. Pour over rice mixture and stir until well-mixed. Tightly cover the dish with aluminum foil, and bake in the oven, stirring occasionally until rice is tender and most liquid is absorbed, about 50 minutes (I stirred it twice). Chop chicken cutlets into bite-sized chunks, and stir in to risotto after 50 minutes is up, adding more broth as necessary to keep the rice moist. Re-cover and bake 15 more minutes. Finally, stir in sliced spinach, cream (or milk) and cheese. For pancetta frizzles, cook sliced pancetta in a small skillet with olive oil for 5 – 6 minutes, until crisp. Serve risotto on a plate or in a bowl topped with pancetta frizzles. Here’s the dish after I took a spoon to it. Sorry, I couldn’t wait to dig in. The crispy pieces of pancetta give this risotto just the right bit of crunch and saltiness. 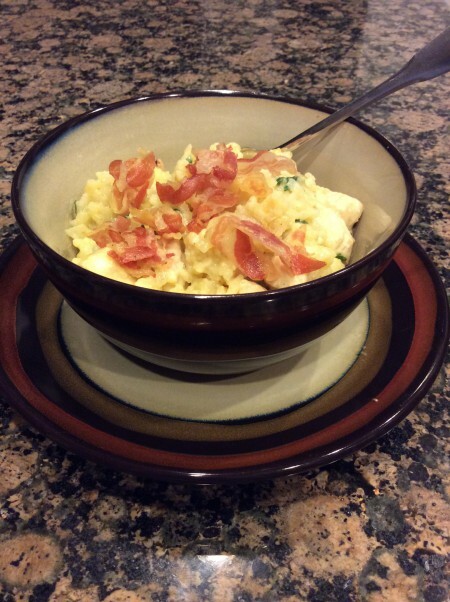 This entry was posted in Entrees, Recipes and tagged Bacon, Baked, Baked Risotto, Chicken, Chicken Risotto, Easy, Easy Risotto, Entrees, Pancetta, Prosciutto, Recipes, Rice, Risotto on October 4, 2014 by Paige N..